Yesterday I caught up with Joel for some very enjoyable practice games. In the first two games Mithridates squared off against Sulla. I took the scythed chariot to assess its potential, as well as an Armenian ally of a 4Kn amd two LH: Cv (gen), SCh, four 4Bd, two 3Ax, Ps + 4Kn, two LH. In the first battle, Mithridates was the defender, and went for a battlefield of two gentle hills, a hamlet and a patch of rocky ground (both RGo). This battle opened fast, with Roman psiloi advancing to face the scythed chariot. I opted to go after it with the Kappadokians, who were supposed to face the Roman cavalry. They killed it, but then were facing Roman legionaries, and the whole battleline was disordered. My combat dice were bad, but they shouldn’t have saved me from being dragged into such a disruptive effort to save the chariot. I lost. The second battle saw Mithrdidates on the offence facing an impressive city in the Balkans (Diocletian’s palace). 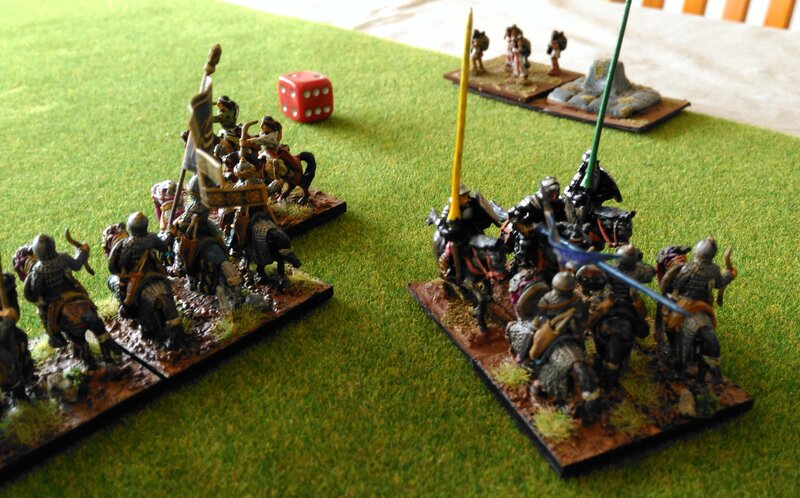 This time the chariot got stuck into some blade, along with the cataphracts. In short order the chariot had destroyed some blades and advanced into overlap onto some psiloi that the cataphracts routed. 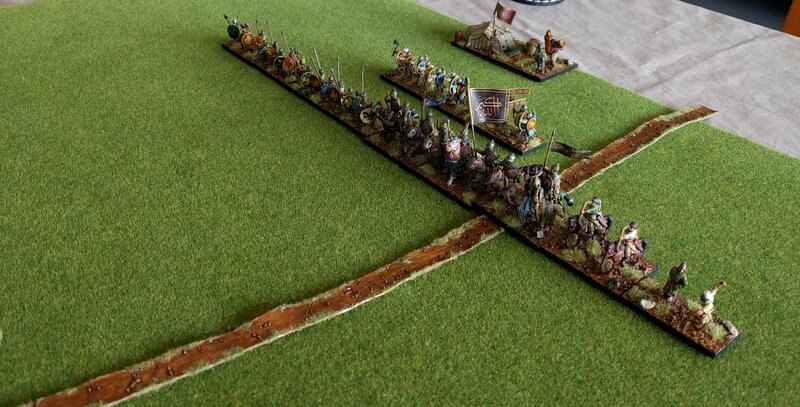 The Romans were limited by PiPs in their response, but they managed to destroy an Armenian LH (these had rushed forward to cover the cataphracts, and avoid being attacked by the Roman cavalry). 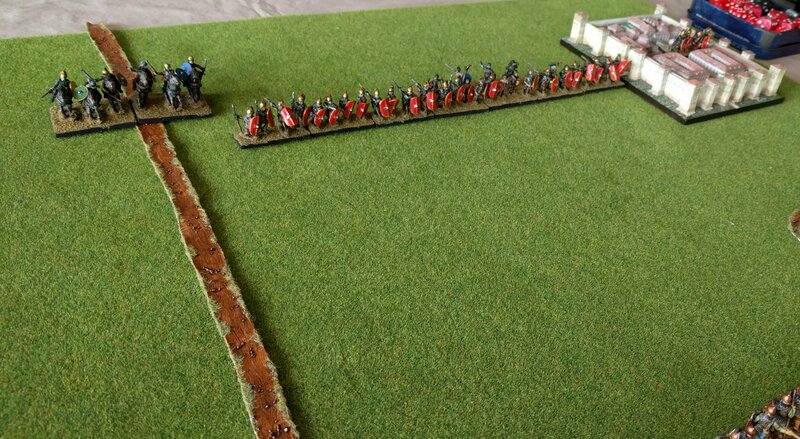 The Roman response on their right flank. Mithridates decided to continue the attack with the cataphracts, and to send the chariot out to the left to attack another legionary element. The remaining light horse retired. The chariot failed this time, and the cataphracts got a draw with the legionaries — not good. Now we were 2-2, but I had only 9 elements to the Romans 10. After combat, the chariot and cataphracts are destroyed. There was a lull while we both reorganised (and battled low PiPs). The Romans won this one too, as I committed the imitation legionaries at little chance of success. The psiloi on their right fled, leaving its neighbour to be overlapped. I was pressured into this, as the two Kappadokians in the woods were risking being overlapped when the Romans advanced against them. 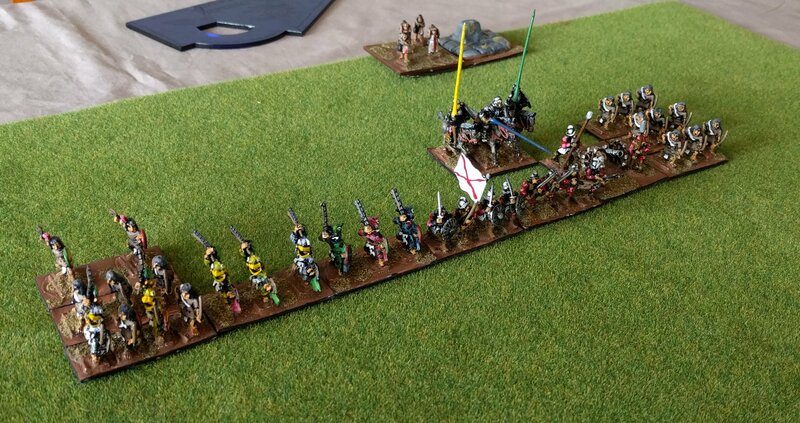 On reflection, the Kappadokians would have been better on the other flank to face the cavalry. They did little in the woods. Overall, the verdict on the chariot is that it’s not a super-weapon, but could add some interesting wrinkles to a battle. After lunch it was the turn of the Samanids. First up they faced Aztecs (in the New World too, a first for the fabled Samanid navy!). The Aztecs deployed between two woods, while the invaders chose to deploy in the open. The Aztecs advanced beyond the woods. 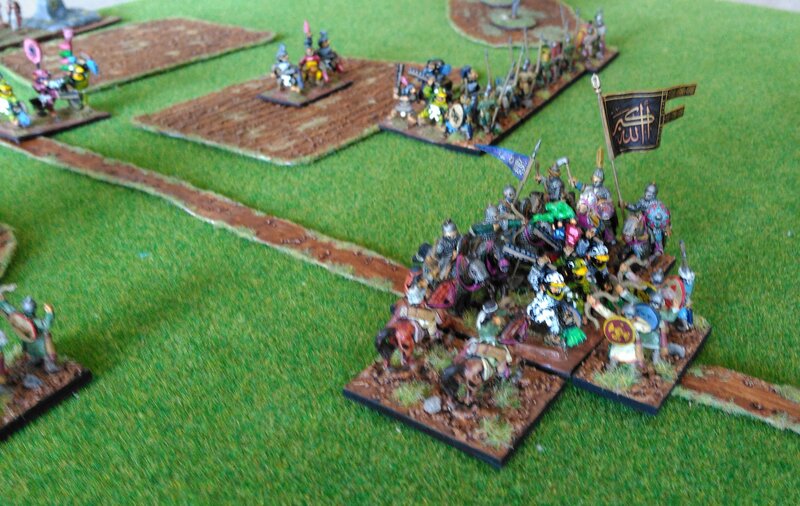 The Samanids saw an opportunity for their archers against the Aztec psiloi and moved them to their left as they advanced and methodically began to destroy hordes with their spear and cavalry. In time we succeeded in killing all but one of the hordes (that one being the one that Joel had hoped would go, as it had a warband behind it, waiting to attack). We also got the two psiloi with two archers and a psiloi. In the centre one enemy blade had also been destroyed. However, one of our cavalry was destroyed, as had a bow. The enterprising enemy blade rushed through the gap he’d created and attacked our reserve, an element of archers. It survived the first round of combat, and then we surrounded it. The blade is surrounded. 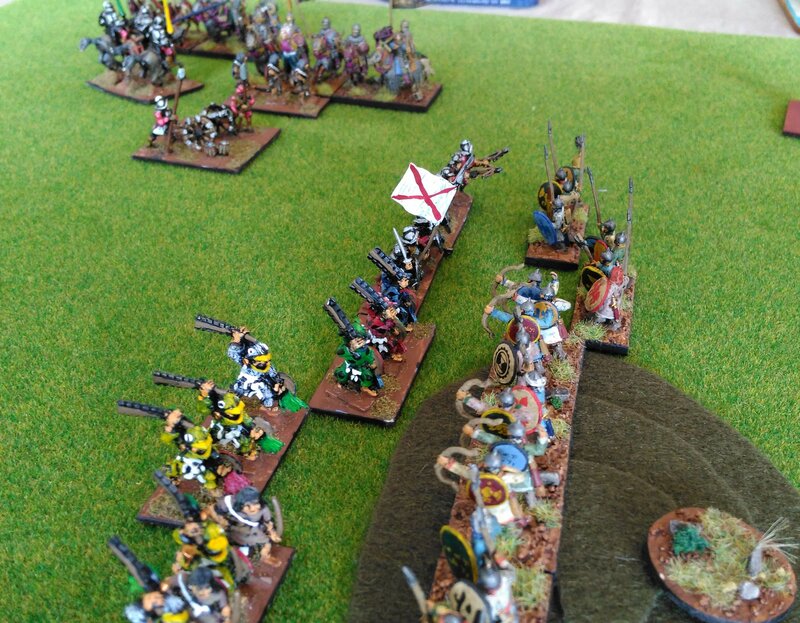 The enemy general had retreated a little, and the remaining horde and warband can be seen in the background. It survived, forcing us to recoil. The next turn it got that archer, while the general was able to attack my remaining archer that was in a wood, which broke in terror. I lost 4-3, though 8 of the Aztec elements had been broken! An excellent game. My last game saw the Samanids face Cortez (IV/19c) and his Tlaxcalan allies. This time they were defending. Their hills and rough going was all in one part of the battlefield, which they were defending. 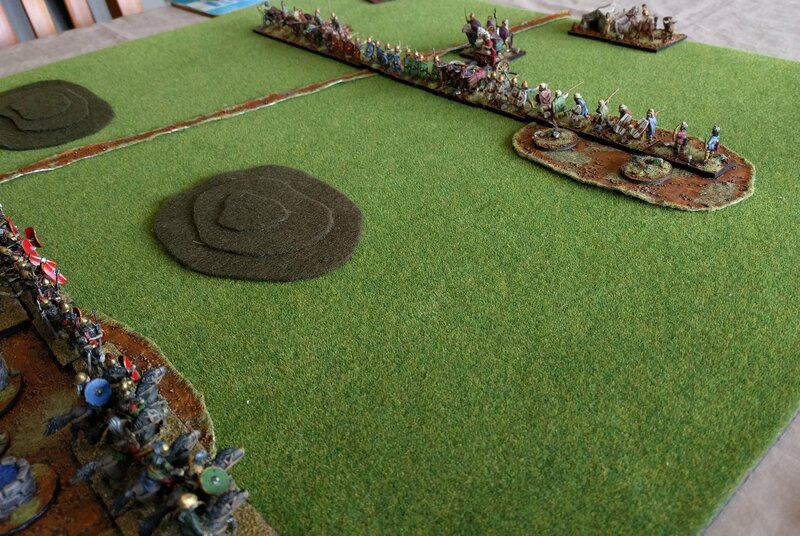 I hoped to neutralise the artillery with my spearmen, while the archers shot from the protection of the hill. Getting into position on the hill took time, and the first element of archers to make it over the crest advanced into a hail of arrows and fled. 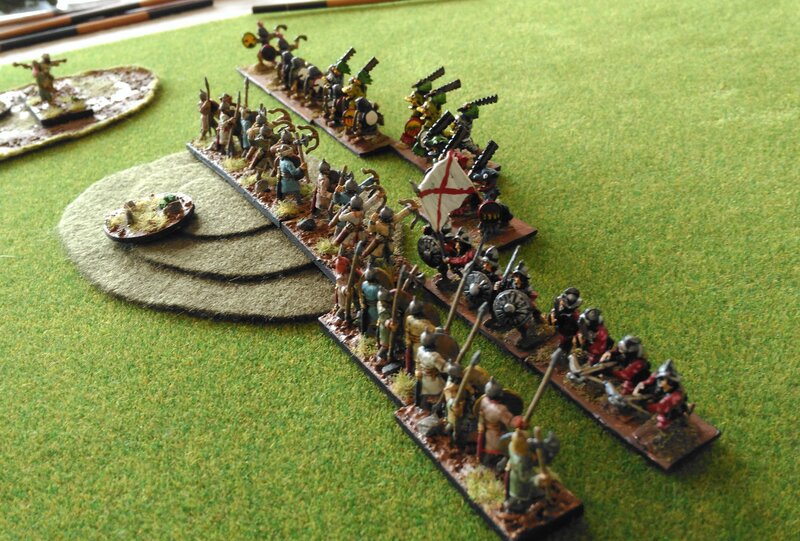 The other two did get themselves into position, but did not feel they had the numbers to advance, especially as an element of spearmen had been shot away by the artillery. What saved the Samanids was the slow reactions of the Spanish. In desperation the Samanid cavalry moved to outflank on their right flank. The response was a series of 1 PiPs. On the first, a single archer turned and shot at the Samanid LH, who recoiled to the edge of world. They paid for this by being fallen upon by the cavalry, who double-overlapped it and routed it. 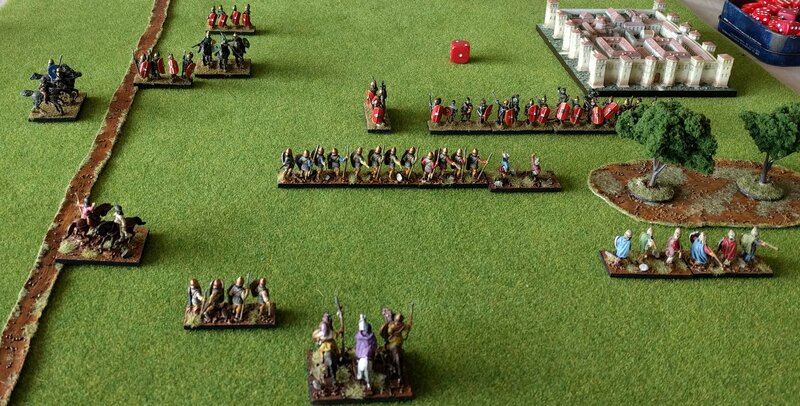 Another 1 PiP by the Spanish saw Cortez advance to face the cavalry. They ignored him and destroyed another archer. 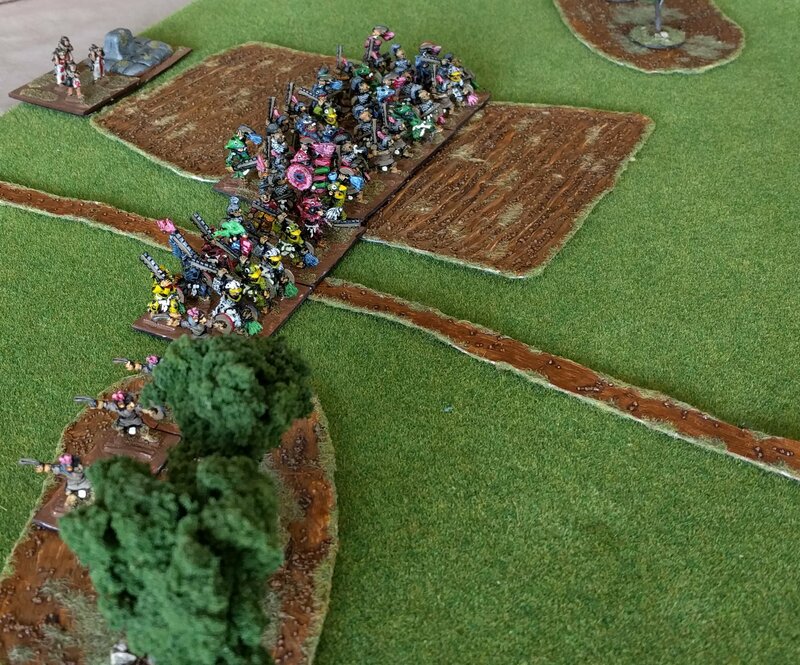 This continued until all three archers on that flank had fled. The Spanish response was to advance in the centre, but it proved too late; fast blade advancing uphill against solid bow in bad going made no headway. And the Samanid spear survived a round of combat against the Spanish solid foot. Cortez advances on the Samanid foot.In the background the dire state of the Spanish left flank can be seen. Meanwhile, the Samanid cavalry surrounded the Spanish artillery, while one cavalry sought to delay Cortez (they’d recoiled when facing him with LH flanking; now the LH joined the fight on the artillery. Cortez could only look on as his artillery joined the rout. Cortez is unable to save the day as his artillery is destroyed. The Spanish notice their left flank has broken and start to flee. 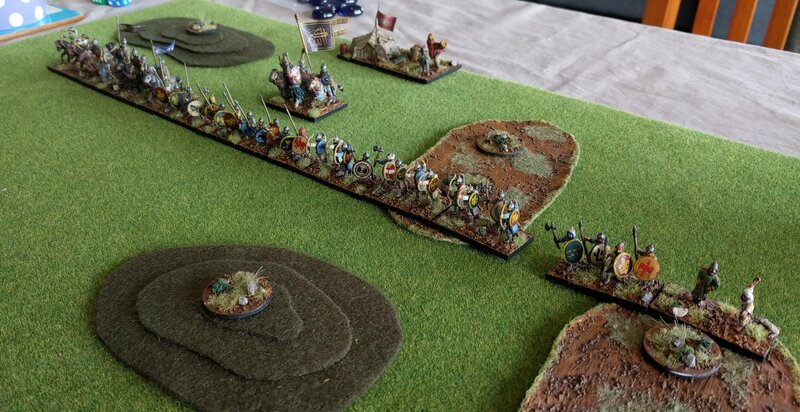 The final battle of the day was my only victory, and it owed a good deal to luck, but I enjoyed all the games, and learned a lot about using these two armies. In particular, I can see mastering archers as taking a while. Also, the scythed chariot is a challenge to use so that it disrupts the enemy, and not my own army. Great report Mark. It sounds like four very enjoyable games. They were. Victory hung in the balance in each. I’m of course very pleased that I won’t be blamed for a loss because of the city!